Despite having a numerical advantage for 20 minutes Motherwell failed to score against Rangers at a cold and wet Fir Park. The visitors grabbed two second half goals and deserved to take the points. An early red card for O’Halloran gave Motherwell command of the game but we failed to convert any of the several chances before McDonald was given his marching orders. The game turned and Rangers took charge. It was no surprise to see Miller open the scoring before Hyndman ended the contest late on. Scott McDonald returned as Lasley found space on the bench and our fortunes matched Skippy’s progress. 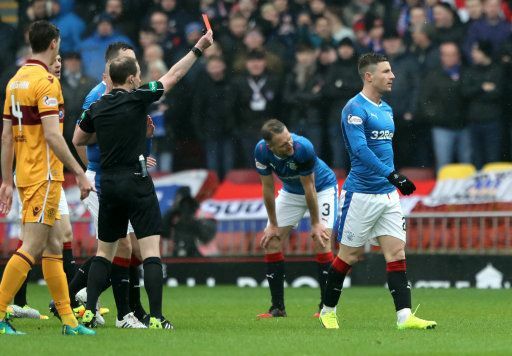 The teams had barely settled before O’Halloran planted his studs into McHugh’s thigh and Willie Collum showed his red card. Motherwell needed no further invitation and pushed forward to press the advantage. McHugh and McDonald had efforts on target before Cadden delivered an excellent low cross that McDonald fluffed in the six yard box. As it turned out it was our best chance of the afternoon. McDonald was sent off in 26 minutes following a challenge on Miller and with him went our chance of breaking the 15 year wait for a league win against Rangers. The 10v10 game that followed was not a classic but it was one-sided. Samson kept us in the game on a couple of occasions but when the ball fell kindly for Miller after a failed attempt by Waghorn we fell behind after an easy tap in. Bowman and Frear were thrown on to attempt tosalvage a point but they were ineffective. Hyndman delivered the final blow in the closing minutes. It was another case of missed opportunities from Motherwell and there will be some relief that we won’t face them again until April.